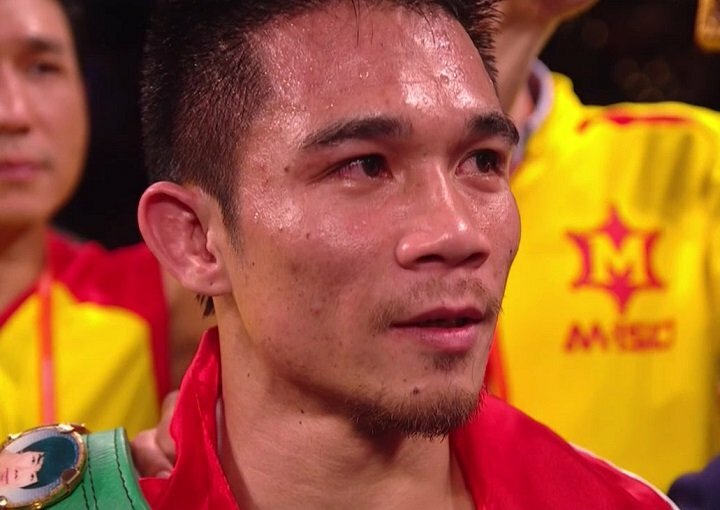 By Jim Dower: In a non-title defense, WBC super flyweight champion Srisaket Sor Rungvisai (46-4-1, 41 KOs)) totally destroyed former world title challenger Young Gil Bae (28-7-2, 22 KOs) in stopping him in the 1st round of a scheduled 10 round fight at the Workpoint Studio in Pak Kent, Thailand. The powerful southpaw Rungvisai dropped the 38-year-old Korean Bae late in round 1 after nailing him with a left to the head. he referee then stopped the contest before Bae could get back to his feet. The official time of the stoppage was at 2:50 of round one. Rungvisai controlled the entire one-round fight, pursuing Bae around the ring, nailing him with straight lefts and right hooks. Bae was backing up continuously, taking heavy blows to the head and occasionally firing back nice shots in response. Bae’s punching power and hand speed was actually quite good. He was getting the attention of Rungvisai was landing his shots. Bae is a better puncher than Rungvisai’s last two opponents Juan Francisco Estrada and Roman Gonzalez. Bae didn’t possess their talent obviously, but his punching power and hand speed was better. The Rungvisai vs. Bae fight was a total mismatch, but it was intended as a tune-up fight for the Thailand fighter. It probably wasn’t the best fight to watch for Rungvisai’s fans, which had come to see him fight live at the Workpoint Studio in Pak Kent. Bae was in absolute distress from the first clubbing left hand that Rungvisai nailed him with. Initially, Bae tried to stand his ground at center ring against Rungvisai, but after he was tagged hard by a left hand, he immediately thought better of it and started backing up. After the first five seconds of the fight, it was all Rungvisai. He was smashing the hapless Bae with everything but the kitchen sink, sending him backwards with each crushing blow that he would land. The fight, if you want to call it that, would have been over in the first 60 seconds if Bae had stood his ground, but he wasn’t interested in doing that. He was only trying to survive by giving up real estate to Rungvisai. Bae would have been better off if he had stood and let his hands go, because he showed enough power to make a fight of it. It’s likely that Bae thought he could use the blueprint that Juan Francisco Estrada created in using movement against Rungvisai for 12 rounds to minimize the amount of heavy blows that he could land. That strategy didn’t work well enough for Estrada to beat Rungvisai, but it allowed him to survive their entire 12 round fight last February. It was clear that Bae was not going to be able to duplicate the efforts from Estrada, as he didn’t have good enough wheels to circle the ring for 12 rounds in a pure survival mode the way he had. Bae looked uncomfortable in backing up constantly. Bae didn’t possess the lateral movement to keep out of range of Rungvisai’s powerful fists. It wasn’t a good situation for he over-matched Bae. Before tonight’s massacre, Bae hadn’t fought in 14 months since fighting to a six-round draw against Kittisak Boonchaiming (1-0-1) on April 22, 2017. Bae is a decent fighter, but he didn’t belong in the ring with a guy of Rungvisai’s class tonight. It’s doubtful that Estrada will want a second helping of a fight against Rungvisai, as he doesn’t have enough power to stand up to him. Ancajas would be an interesting opponent for Rungvisai if his promoters at Top Rank were to allow him to take the fight. Unfortunately, I don’t think they will. Top Rank is matching Ancajas against guys that are a non-threat to him. If Rungvisai is able to move up in weight in 2019, he could challenge the winner of the World Boxing Super Series bantamweight tournament, which figures to be Naoya Inoue. Rungvisai vs. Inoue would be a huge fight for HBO Boxing or one of the other networks or streaming services. It remains to be seen whether Rungvisai will be interested in moving up in weight to the 118 lb. weight class in 2019. There’s money obviously to be had for Rungvisai if he moves up to bantamweight, but he might not be as quite as dominanent in that weight class as he’s been at super flyweight. Rungvisai made a name for himself in 2017 in twice defeating former #1 pound-for-pound star Roman ‘Chocolatito’ Gonzalez and then beating former flyweight world champion Juan Francisco Estrada. It was impressive the way that Rungvisai chopped Chocolatito down in stopping him in the 4th round in their rematch on September 9 last year on HBO at Madison Square Garden in New York. Some boxing fans thought Gonzalez would avenge his earlier loss to Rungvisai, but that notion was dispelled when the powerful knockout artist from Thailand dropped Chocolatito twice in the 4th round to get the stoppage. If Rungvisai can keep the momentum going with his career, he could be heading towards stardom, especially if he defeats the winner of the WBSS bantamweight tournament.